What is the Best GPU for Mining Ethereum? Let's Find Out! Home CryptoCurrency Mining What is the Best GPU for Mining Ethereum? Without a doubt, Ethereum is getting more and more popular among cryptocurrency miners. According to some estimates, Ethereum is on its way to overtaking bitcoin market cap valuation. This is why there is an increased interest in Ethereum and more, as more people are now looking for the best hardware, like best GPU for mining Ethereum. For those who want to create their own Ethereum rig, we have already discussed an in-depth tutorial how to build an Ethereum rig in one one of our previous posts. The most critical component of the Ethereum mining rig is the GPU. Unlike PC, where CPU does all the hard work, GPUs process the algorithms in a mining rig. This means the performance of your mining rig depends on the GPU you use. The two most commonly used GPUs for crypto-mining are by NVIDIA and AMD. When AMD GPUs are significantly cheaper than NVIDIA, they are slightly more challenging to configure. 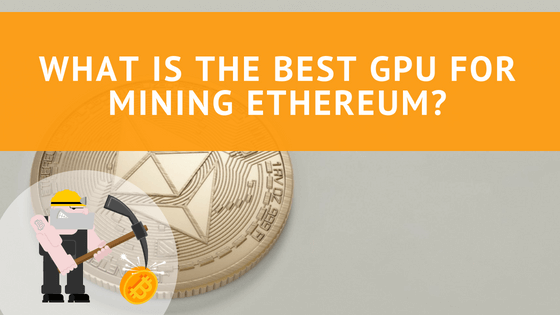 To decide which one is the best for Ethereum mining, you first need to look into few factors. Keep in mind, powerful GPU is not always the best option for mining. You need to look for the GPUs that consume less electricity for the work they do. For example, you must choose the GPU that offers you the sweetest spot based on performance-per-watt calculations. So, which one is the best GPU for mining Ethereum when it comes to performance-per-watt? The answer is: AMD RX 580. As mentioned above, the AMD GPUs are cheaper compared to NVIDIA. In addition, they also offer you best value for your money as the performance is at par with NVIDIA’s. One of the best AMD models is RX 580. Even though it is designed for high-end video games, but works perfectly for Ethereum mining rig. In fact, the entire RX series offers you the best per watt performance. As the price is also low, it saves you even more. The AMD RX 480/580 series is an upgrade of their previous popular series, RX 470/570. The hash rate it offers is 30 Mh/s while the power consumption is 100W-250W. Even though it is best for mining Ethereum, but it can also work for other algorithms, like Monero and Zcash, in case you want to switch for any reason. Why is AMD RX 580 Ethereum Mining GPU the Best? There are plenty of reasons for this. It is cost effective, so the cost of your mining rig remains at affordable levels even if you are building a 6 GPU, 8 GPU, or even a 13 GPU mining rig. It comes with all the features that can optimize your Ethereum mining efforts, like 8GB DDR5, PICe 3.0 x 16, along with GPU Clock. It’s also pretty lightweight, as it weighs only two pounds, that keeps the weight of your rig under check. The driver is not included in the package, so you need to download it to install. There are plenty of online videos available that can guide you how to install this driver to your rig. AMD RX 580 is a great option for those who want to keep a check on the cost of their mining rig, and looking to maximize the performance of their mining-rig without adding too much to their energy bills. Next articleHow to Build a Zcash Mining Rig?